Wisconsin RB Melvin Gordon could put an end to the quarterback run of Heisman winners in 2014. Bovada got a jump on the 2014 Heisman Trophy race by releasing its early odds, which can be appropriately received as the starter’s gun pop on those incessant debates we love so much. Predictably, Florida State quarterback, and reigning winner, Jameis Winston tops the list as a 2/1 favorite to do something nobody has since Ohio State’s Archie Griffin in 1975 – repeat as Heisman winner. Oregon quarterback Marcus Mariota follows Winston with 7/2 odds, and Ohio State QB Braxton Miller takes the third slot at 4/1 odds. Surprisingly, Auburn QB Nick Marshall didn’t make Bovada’s initial cut, which seems strange considering he’s among the nation’s more dynamic quarterbacks – meaning, in this context, he helps his Heisman case by both passing and running – and is a senior returning to the defending SEC champion and national runner-up. Marshall’s absence can be taken two ways: Bovada doesn’t believe he’ll improve enough as a passer in 2014 to stand his ground in a crowded QB field, or Bovada expects significant regression from the Tigers, with a few losses in 2014, which would effectively end Marshall’s chances. A third reason for dismissing Marshall from this early discussion escapes me; don’t you think some people, their opinions of Auburn and its QB still soaring from last season, would have laid a bit of money on Marshall were he available? Of course, nobody knows what will unfold when another fresh, long season commences, making it difficult to narrow the Heisman field. We actually don’t begin doing that with any degree of effectiveness until November, really. 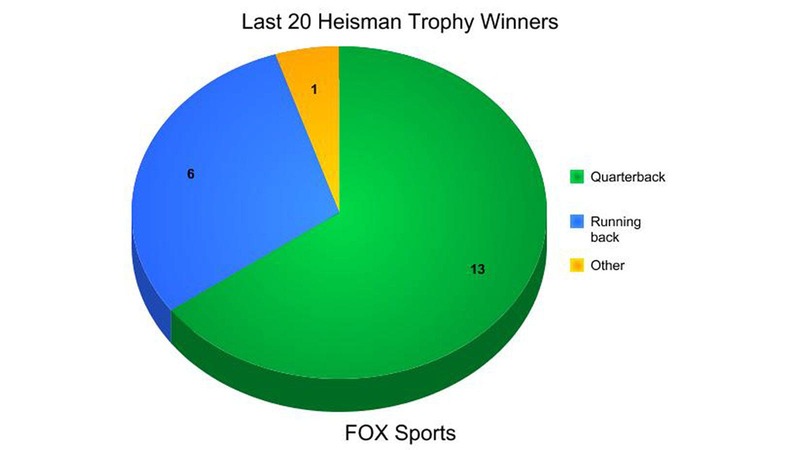 So at this juncture of Heisman discussions, you’re merely hunting for value. And if I were among those of you descending on Las Vegas in the next week for Super Bowl festivities, I’d look long and intensely at Wisconsin running back Melvin Gordon, sitting in the middle of the initial Heisman pack at 16/1 odds. Woah, yeah, that’s a lot of green. Quarterbacks have done well in the last two decades, and specifically in the most recent decade-plus as football has shifted to a more pass-heavy game. Out of the last 14 Heisman winners, 12 have come from under center. Winston could easily give the quarterbacks another one in ’14 as the clear favorite. So given that trend, then, why a running back as this season’s best value? 1) You must have great stats. 2) You must play on a winning team. 3) It would benefit you significantly to have one of the easier schedules in November, when the award is typically locked up. Gordon, if he stays healthy, is a virtual lock for huge numbers in 2014. He rushed for 1,609 yards and 12 TDs in 2013 – ranking second in the nation in yards per rush (7.81) among backs with at least 100 carries – and he wasn’t even the most-used RB on his team. Gordon’s 206 carries were second to James White’s 221 (who accumulated 1,444 yards – 6.5 per pop – and 13 TDs on those carries). White, a senior in 2013, is now gone, and you can fully expect Wisconsin to ride Gordon like another recent Badger running back who delayed his entry into the NFL for one more season in Madison. Will that increased workload chip into Gordon’s per-play production? Sure, but he’s still a freakishly talented and physical back at 6-foot-1 and 203 pounds. “He’s one of the most explosive guys at his position,” a rival defensive coordinator told me during the 2013 season. “The hardest thing for an athlete to do is restart his feet after contact with power. Now, let’s say the higher quantity of carries decreases Gordon’s production by a full yard per attempt, which would be a ton. At 6.81 yards per play, Gordon would rush for 2,043 if given 300 carries. If Gordon gets 320 carries, he’d rush for 2,179 yards and bypass the number Heisman finalist Andre Williams posted last season (2,177). And if Gordon was given the same number of carries Williams got in 2013 (355), he’d rush for 2,418 yards. Personal numbers remain the primary Heisman hurdle, but Gordon has the other two working in his favor as well. The 2014 schedule gods gave Wisconsin a wet smooch. It opens against LSU in Houston, but then here’s the rest: Western Illinois, Bowling Green, USF, at Northwestern, Illinois, Maryland, at Rutgers, at Purdue, Nebraska, at Iowa, Minnesota. The Badgers miss Ohio State, Michigan State, Michigan and Penn State. The November slate contains the final four games listed above. Even with the exiting talent – in addition to White, losing linebacker Chris Borland and receiver Jared Abbrederis will surely sting – it’s difficult to imagine the Badgers not going 10-2 at worst. Gordon is a huge advantage, and rising junior QB Joel Stave should improve. There are other interesting Heisman values out there, but none of them look as good as Gordon. UCLA quarterback Brett Hundley (12/1) could put up a monster season and might even lead the race if the Bruins have a magical season, but they play a grinder of a schedule with home games against Oregon, Stanford and USC and away games at Arizona State, Washington and Texas (no, playing Texas in Cowboys Stadium doesn’t seem “neutral”). Georgia running back Todd Gurley and South Carolina RB Mike Davis are spectacular players, but they have to not only overcome the Heisman QB bias but do it against SEC defenses. No thanks. FSU running back Karlos Williams at 33/1 is tremendous value, but he’ll never outshine Winston on a successful Florida State team. Miami RB Duke Johnson at 33/1? Unfortunately, don’t think the Canes will win enough to set Duke’s campaign loose. Oklahoma QB Trevor Knight at 25/1? Intriguing, but the Sooners’ schedule – includes Texas, Kansas State, Baylor, at Texas Tech and Oklahoma State – is a minefield compared to Wisconsin’s. The longshot quarterbacks – Bowling Green’s Matt Johnson 66/1 and Marshall’s Rakeem Cato – at 66/1? Fun thought, but if Northern Illinois’ Jordan Lynch couldn’t seriously contend for a Heisman, how can we expect a different non-major conference QB to do better? We can have fun debating this until camps kick off and in August. I don’t expect Gordon to win the award in 2014. If forced to pick a winner now, I’d take Braxton Miller, the perfect Heisman package – quarterback, weaker schedule, good team and will put up impressive passing and rushing totals. But if value is what you’re after, Gordon’s the guy.